Proper storage of wine helps to ensure the contents will be served in their prime state. Unfortunately, there are a large number of wine collections damaged each year due to uneven temperature and humidity when being stored. Here is a basic guideline to wine storage and why temperature and humidity matter. Temperatures that are too warm, around 65 degrees Fahrenheit, cause the cork to start drying out, at the same time causing the fruit in the wine to age prematurely. 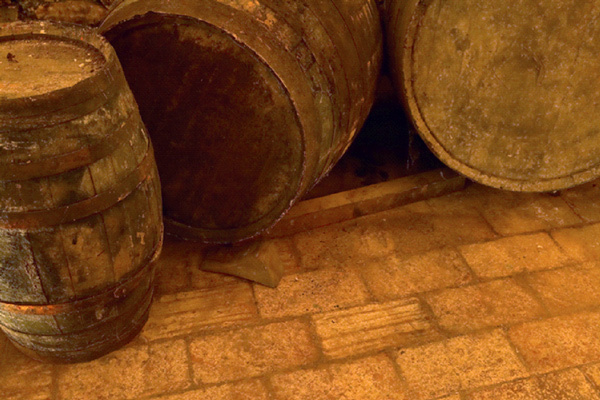 When the cork dries out, air and humidity begin to seep into the wine, resulting in discoloration and either a sour or bitter taste. Storing wines in areas that are too cool, below 45 degrees Fahrenheit, can slow down the maturation of the wine, leaving strong tannins and an extremely acidic bite. Storing wine in these cool temperatures will cause an unbalanced product. Humidity plays a big part in wine taste. Just like temperature, if the humidity is too high or too low, the wine can become damaged and unpalatable. Ideal humidity for storing wine to maintain optimal taste is between 60 and 70 percent relative humidity. If the humidity is any higher, mold can actually start to form inside the bottle. Too dry of a climate can dry out the cork, exposing the wine to air, releasing the aromas, and unsettling the fermentation process. We know that a warm, humid climate will help age wine. We know that a cool, dry climate will keep the wine from aging. Now, we are armed with the most important tool a wine expert can have. Being able to work with the age of wine, you begin to understand how to make a good wine even better. For wines that need to age, storing them at a slightly warmer temperature will speed up their aging process so that you may enjoy them sooner. The biggest trick is to gradually increase the temperature over a few days so as not to shock the wine. Giving the wine time to slowly raise its internal temperature will allow the enzymes to break down the sugars and allow the wine to become more complex. Having too high of a temperature, too quickly will not allow the wine to develop slowly, which develops the taste properly. Delaying or slowing a wine's aging process is not required quite as often as speeding up a wine's development. However, once a bottle is opened, holding back further developing is a good idea. Slowing the aging process of an opened bottle of wine is commonly done by storing the open wine in the refrigerator. Freezing wine is not recommended as the ice crystals can alter the flavor of the wine as well as introduce water causing dilution of the wine. Generally speaking, storing wines between 50 and 60 degrees Fahrenheit with a relative humidity around 50 percent is the best way to preserve wine taste and keep the integrity of the wine intact. If the aging process needs to be slowed down or sped up, adjusting the temperature gradually will allow you to have a slight effect on aging the wine. For opened bottles, storage in the refrigerator is recommended, but freezing is not advisable. Storing your wine at the proper temperature and humidity will ensure that your next wine tasting will give you the results you expect and appreciate! Temperature and humidity are two of the most overlooked aspects of wine tasting. When wine is not kept within the best temperature and humidity ranges, wine may age prematurely or lose aromas which can damage the wine.